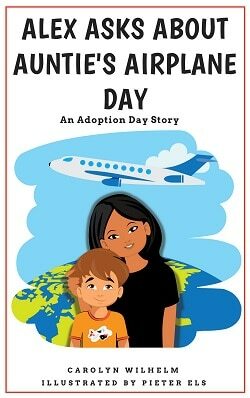 Alex Asks About Auntie’s Airplane Day: An Adoption Day Story is an easy reader picture book to help young children learn about multi-race family adoptions. By looking at the celebration through the eyes of the youngest family member, the “gotcha day” party helps him understand his aunt was adopted from South Korea. The family gets ready, starts out driving, has a flat tire, and makes it in time. They ring the doorbell and auntie answers. The now auntie arrived as a baby to the Minneapolis airport — to be placed into the waiting arms of the adoptive mother, Carolyn (who writes the Wise Owl Factory blog and lessons). 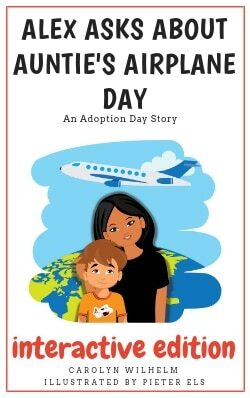 The “twist” in the story is that the adopted person is an adult, not the child in the story. Over 30 years ago, I (Carolyn Wilhelm) and my husband adopted our darling daughter from South Korea. She was 10 months old. We welcomed her home with a party. 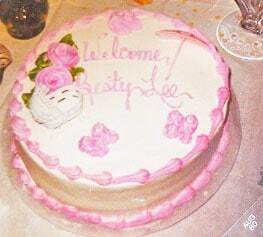 The cake decorator made an error spelling her name and wrote, “Besty.” She has been the best! The misspelling is a family joke, of course. Auntie Airplane Day had this photo taken when she was at the St. Patrick’s Day parade a few years ago. She was born in South Korea, therefore has lived in Asia. We lived in the Netherlands when she was 3 and 4, so she has also lived in Europe. She lived in North America also, twice (before and after we lived in NL). By the age of 3, therefore, she had lived on three continents. She still gets around being proficient in German and knowing some Japanese, and has traveled using those languages. 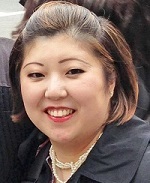 She is the expert behind some of the posts, printables, and freebies on this site such as Shanghai A to Z. She also helped with the presentations about Japan, as well as other posts. She sets me straight on German words and important cultural knowledge I should probably already understand. 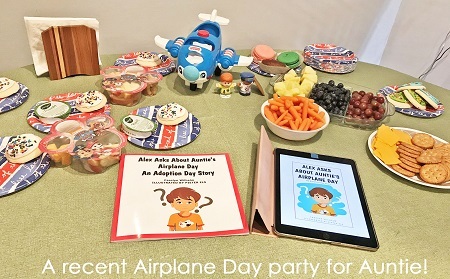 This year’s party included the new storybooks. The storybook was written by Carolyn Wilhelm, and illustrated by Pieter Els of Surfer Kids clip art and Surfer Kiddies. Although Carolyn and Pieter live almost 9000 thousands miles apart, they have become online friends and teamed up to self-publish this book together. There are three versions of the book. There is a paperback version available on Amazon. A plain eBook for Kindle Paperwhite or iPad is available. This is the non-interactive version of the eBook. The interactive version is for Kindle Fire and Android devices only. It was made with the text-book creator, so each page has an icon to press which makes an interactive appear (an illustrated word, a sound, or a video). It is not a game or app. Textbook, you know, I’m a teacher. The sound icon when pressed has a sound recording, and the play button must also be pressed. It is not instantly interactive. One sound is a baby crying, one is a baby cooing. The videos work the same way: press the icon first, then press the play button. My husband tries to answer the door each time I play the doorbell sound, be forewarned. 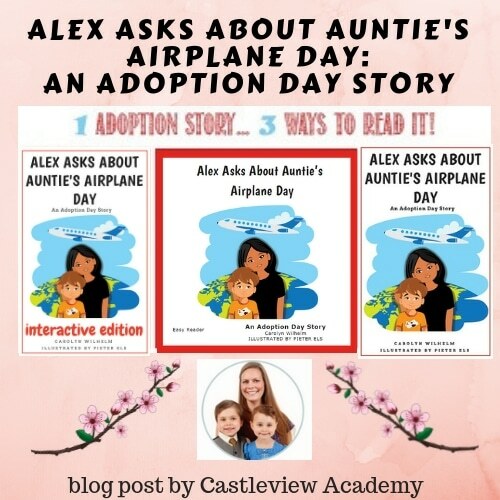 Castleview Academy says it best and has described the different versions, and also has some videos of her adorable children reading the book on her blog post about the book. Pieter Els is the illustrator. He sells clip art on Teachers Pay Teachers as well as his own site, Surfer Kiddies. Pieter has designed much of the art on this blog. He has also been a technical help for me. 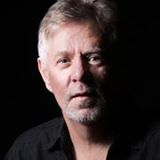 He is all around talented in art, graphic design, and technology. I highly recommend his work. I try to have some sort of free download for most of my blog posts. 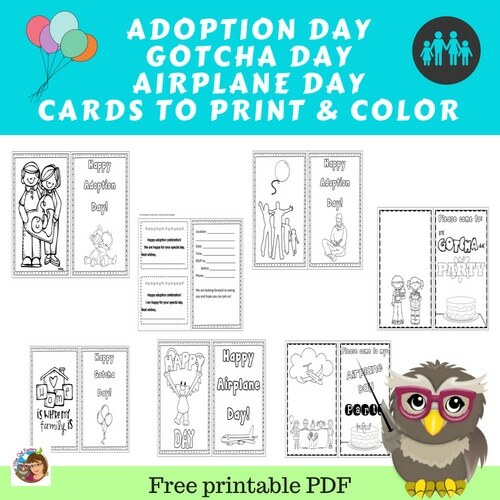 For this post, I made some free adoption day cards you may download, print, color, and give to people. There is a lack of such cards available in stores. In recent years I have noticed more awareness for this kind of commercial card. I hope this will help some people celebrate adoptions and celebrations. Interesting reading about the different editions. Especially the interactive one. Thanks for sharing. Thank you for the comment. I liked your Facebook page!